Beau & Sons Tree Service is a locally owned and operated full service tree service company located in the Brant County area that has been in business for over 40 years. Our staff are trained, experienced, and equipped to deliver the highest quality of service to Brantford, Brant County and surrounding areas. We take pride in the credible reputation we have earned servicing our community. Our exceptional clean-up job is one of the many aspects of our services for which our customers consistently praise us. Much of our work is gained through our satisfied customers referring us to their friends and family. We handle tree removal, tree trimming, fruit tree pruning, hedge trimming, hedge removal, stump removal along with various other residential and commercial tree services. 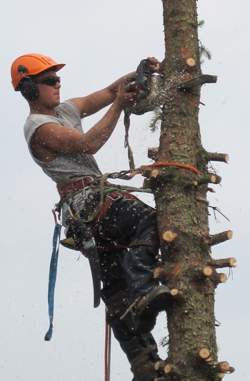 We have a certified arborist on staff for consultation. The goal of our company, Beau & Sons Tree Service, is to provide you with the highest level of customer satisfaction that has fueled our company for the past four decades. We offer 24 Hour Emergency Service and are fully insured.